Wearing T-shirts with geeky references or designs is great, but if you want to take your geeky fashion statements to the next level, maybe you should try out a tee designed with your smartphone in mind. 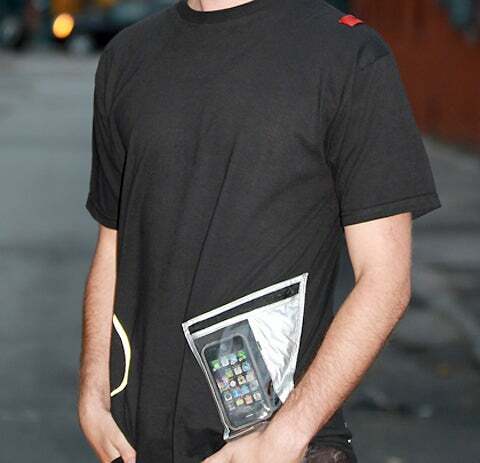 The Alphyn Tee by Alphyn has a special compartment for your smartphone: On one side is a specially angled zip pocket, perfect for grabbing your phone on the quick. The phone pocket is made of a transparent polymer film, which lets you view--and control--the touchscreen without having to the phone out. As an added bonus, headphone wires are kept out of the way with the little tab on the shoulder. Though the shoulder tab is pretty useful (I for one find earbud headphones fall out of my ears a lot, so this could stop them trailling), the pocket looks, well, a little strange. The polymer is certainly cool for quick answering of a phone call, but do you want to type looking down at your side at an odd angle, especially if you're walking down a busy street? Though if it's a statement you're after, you'll certainly get it in this tee. If you're interested in the Alphyn Tee, you can pick it up in a range of colors and sizes for $45.